stronger growth and overall performance. So, rather than trying to sharpen the pencil with your cleaners, sharpen the schedule to ensure you are getting bang for your buck. It pays (literally) to spend a little bit more to get a higher quality clean. Health Clubs are a breeding ground for bacteria due to the high level of skin contact and sweating. Wiping the vinyl sweat areas and hand areas of the equipment after use can greatly reduce the risk of spreading infection. Provide anti-bacterial soap in the bathrooms for hands and anti-bacterial bodywash in the showers will further reduce this risk. Not only will it reduce the risk of sickness, your club will rate much higher with your members for cleanliness and it will make it very convenient. In providing these facilities, be sure your staff and cleaners regularly replenish them so that they are always available. If the dispensers are there but are empty, this will discourage the use of them and if empty for too long, members will not use them at all. At Cleaning Edge Solutions, we are committed to ensuring the highest standards of cleanliness and sanitisation are maintained at all times at your gym or fitness facility. 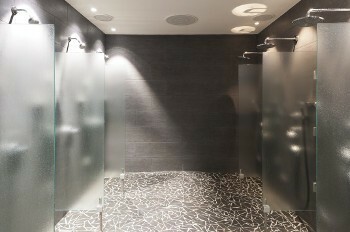 We know the importance of hygiene in this type of environment and we have what it takes to deliver a superior service so that you can focus on the more important aspect of your club, having your members contribute to maintaining cleanliness and hygiene, keeping them happy and growing your membership base. Call us now and we’ll be delighted to meet with you and discuss your gym cleaning requirements.